The whistle sounds, and you sprint off the break into the fight. As you slide across the snow into your bunker, your lens fogs up in below-zero temperatures. You take a knee, post up, and pop to your side of your snowy bunker to snapshoot at your opponent with...SNOWBALLS? Every now and then we at Grey Ops come across the strange and unusual, and bring it to the attention of our readers. The wide world of sports is full of oddities, but I was still surprised to come across a winter sport very similar to Speedball called Yukigassen. Yukigassen is Japanese for "Snow Battle". 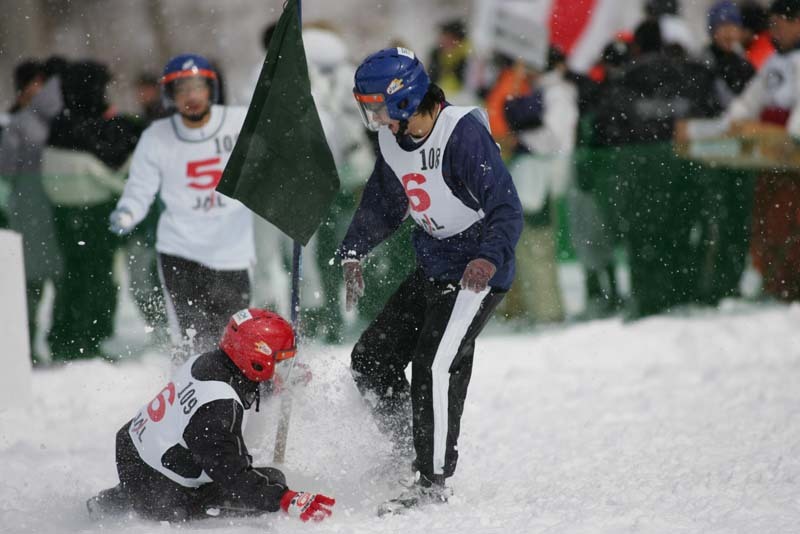 This obscure winter sport originated in Japan, and it's slowly making its way into Canada, which obviously has no shortage of ammunition at this time of year. Saskatoon just hosted a big event, and Edmonton will see bunkered-down players throwing snowballs at each other at a tournament from March 4th-6th. Like Paintball, Yukigassen takes safety seriously. Players wear head and eye protection at all times, and snowballs are made in a special machine designed specifically for the game. The machine ensures snowballs are safe, regulation-sized, and free of ice. Matches are played 7 vs. 7, on a playing field with a Speedball field-style layout. As you can see from the diagram, another thing Yukigassen has in common with Paintball is the goal of capturing the opposing team's flag. And just like in our game, this is accomplished by either eliminating all of the opposing players with snowball hits, or suppressing them with snowballs so that members of your team can move up and go for the flag safely. Matches begin with a breakout from a common starting position, as they do in Paintball. From the whistle, players break out and run for bunkers, trying to take as much ground as they can. They bunker down and let the snowballs fly at their opponents, hoping for an elimination (or at least to keep their heads down). Without "snowball pods", there's obviously a limit to how many snowballs front players can carry with them. "Back players" in Yukigassen stay with the stockpile of snowballs in the rear, and alternate between lobbing them as long shots like mortar fire, and rolling them to players ahead to keep them supplied with ammo. Each team gets an allotment of 270 snowballs, which have to break on the opposing player to count as an elimination (sound familiar?). If an opposing player can catch an incoming snowball from the other team intact, they can use it as their own. This all takes place under the watchful eye of referees. Of course given the choice of ammo, one thing Yukigassen has over winter Paintball is that you never have to worry about pesky barrel breaks. Grey Ops: Bringing the weird and unusual to your attention since 2009.